Leftovers are inevitable – when you cook extra to have meals on hand, when your restaurant dish is huge, when you throw a party, or when relatives send you home with some after a holiday. They can be convenient, and of course, save you time and money, but unfortunately they're not always delicious when reheated. Luckily, with the proper methods for each type of food, you can maximize taste and texture to make it almost as good as the original. We've collected the best tips for many common fast foods, restaurant dishes, and home cooked favorites and provided you with step-by-step instructions for reheating each one. You'll never have to worry about soggy fried chicken or tough pizza crust again! Put the rice in a microwave safe container and break up any chunks with a fork. Sprinkle the rice with a few teaspoons of water and cover with a lid or plastic wrap. Or, cover the rice with a damp paper towel. Heat at full power for a minute, then check if it is hot enough. If not, stir and continue heating at 20-30 second intervals. Put the rice in a small pot and break up any large chunks with a fork. Add a few tablespoons of water and a tablespoon of butter or oil if desired. Cover and cook on medium for 6-7 minutes, stirring every few minutes, until the rice is hot. Combine the rice with a few tablespoons of water in an oven-safe dish, using a fork to break up any chunks. Add a tablespoon of butter or oil if desired. Cover tightly with aluminum foil and bake for 15-20 minutes at 300˚F until hot. Pancakes can be reheated in many different ways. Check out this article from CanYouReheat.com on how best to reheat pancakes. If you want to freeze extra pancakes and waffles, look the instructions in this guide from GoodLifeEats, and this guide from the Pioneer Woman. LeafTV also offers a good guide with pictures. Pancakes can be reheated in the microwave on low power. Put the pancakes on a plate and sprinkle with a few drops of water, or cover with a damp paper towel. Heat 3-4 pancakes at 40% power for 1 minute. Check to see if they are warm, and heat them for an additional 30 seconds at low power if needed. Heat a skillet to medium low and lightly grease with cooking spray or butter. Put pancakes in a single layer and heat until thoroughly warmed, turning occasionally, 4-5 minutes. Preheat your oven or toaster oven to 300˚F. Lightly grease a baking sheet and lay the pancakes on it. Sprinkle with water and cover tightly with aluminum foil. Heat the pancakes for 8-10 minutes until soft and warm. Do not heat for too long, as they will begin to dry out. Sprinkle a few drops of water on the pancakes and wrap them in aluminum foil. Place in the oven at 300˚F and heat for 10-15 minutes until hot. This is not the best method, at the pancakes can get dried out, but it does work. Set the toaster to medium-low and put in the pancake. Toast it once and check if is warm when it pops up. If not, turn it around and toast again. Preheat your oven to 250˚F. Put the steak on a baking sheet and place in the oven for about 20-30 minutes, until the internal temperature reaches 110˚F. Remove from oven and pat dry. Heat a frying pan over medium high. Add a few tablespoons of vegetable oil and heat until shimmering. Add the steaks and sear quickly, just 60-90 seconds per side, until nicely browned. Allow the steaks to rest for 5 minutes before serving. Put the steak in a sturdy freezer zip-loc bag and squeeze out as much air as possible. Heat a pot of water on very low, just until it reaches 130˚F. Immerse the bag so that it doesn’t touch the sides and heat for 5-7 minutes, until fully warmed. If desired, sear by following Steps 2-3 from the oven + stovetop method above. This is not recommended, as it usually toughens the meat. Put the steak in a microwavable dish and drizzle it with a small amount of melted butter, steak sauce, or dressing. Cover the dish and heat for 1 minute at medium power. Check the temperature, and continue heating at medium power for 30 second intervals until it is hot. 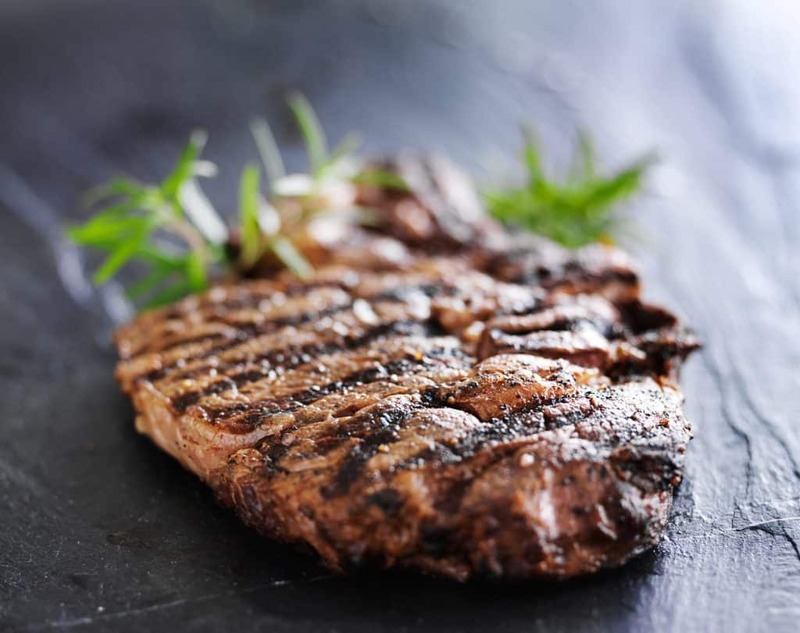 Take the steak out of the fridge and let it sit at room temperature for 30-45 minutes. Heat a frying pan and add the steak, then add a splash of broth. Heat the steak over medium until thoroughly warmed. Heat the oven to 250˚F. Put the steak on a baking sheet and heat for 15-20 minutes, until it is warmed throughout. Take the chicken out of the fridge and allow to come to room temperature – this takes about 30 minutes. Set the chicken on a baking sheet and bake until the outside is crispy and the inside is warm, about 10-15 minutes for wings and legs and 15-20 minutes for breasts and thighs. The best way to reheat fried chicken on the stovetop is by re-frying it. Take the chicken out of the fridge and allow it to come to room temperature. Heat ½” of vegetable oil (not olive oil) in a heavy skillet until hot. Add the chicken and cook for 2-3 minutes per side, until hot and crispy. Remove from the pan and set on a wire rack for a minute before serving. 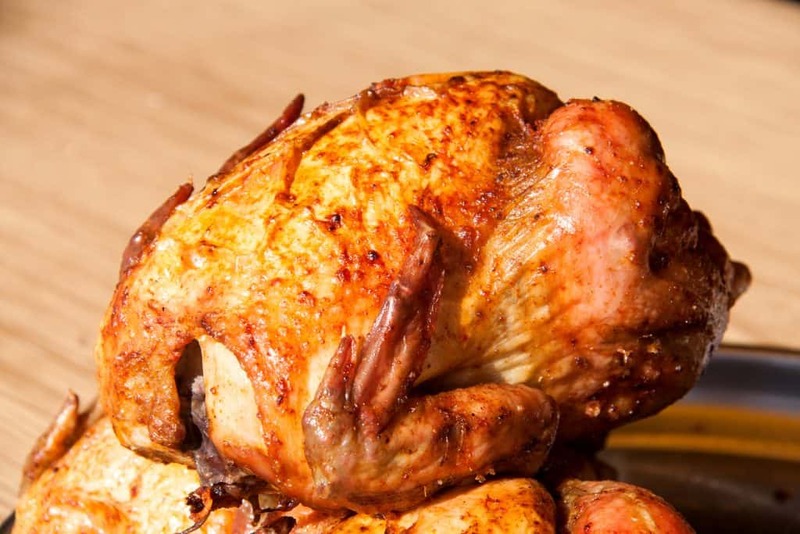 Rotisserie chicken is a common leftover, and it’s easy to reheat. Read this WikiHow guide with several methods, this article with tips on oven and microwave reheating, and this article with an alternative stovetop heating method. Place the chicken in a covered oven-proof dish, or wrap tightly in aluminum foil. If the chicken is whole, cut into pieces. Arrange pieces of chicken in a microwave safe dish and cover with sauce or broth. Cover with a lid or microwave safe plastic wrap. Heat for 2-3 minutes on medium power, then stir and flip the pieces. Heat for another 2-3 minutes or more as need until the chicken reaches 165˚F. Add a tablespoon of butter or oil, and add the chicken pieces. Cook for 4-5 minutes per side, until the center reaches 165˚F. Put the pulled pork in a heavy-duty zip-loc bag and squeeze out as much air as possible. Heat a pot a water to below a simmer – about 150˚F. Immerse the bag put be sure it doesn’t touch the sides. Heat the pork for 20-30 minutes, until hot. Put the pork in a pan and cover tightly with aluminum foil. Bake for 45 minutes to 1.5 hours, stirring after 30 minutes, until the pork reaches 165˚F. Put the pork in a skillet with a splash of broth or apple juice. Heat over low until the pork reaches 165˚F, 15-20 minutes. Avoid reaching boiling temperatures. In a pinch, combine the pork with a splash of juice or broth and cover tightly. Cook on medium-low power for 2-3 minutes, then stir. Continue heating at 1 minutes intervals until hot. Stuffing is definitely one of the tastiest Thanksgiving leftovers, so we want to get it right when we reheat it! Read The Kitchn’s guide to pan-fried stuffing, and Steak Byte’s guide to reheating Thanksgiving leftovers, including this classic dish. Place the stuffing in an oven-safe dish and sprinkle with water or broth. Cover tightly. Bake for 20-30 minutes, until it reaches 165˚F. Not recommended as it can toughen, but it works for small amounts. Put the stuffing in a microwave safe dish and sprinkle with broth or water. Cover loosely. Heat at medium power for 2 minutes, then check the temperature. Stir and continue heating at 30 second intervals if needed. Heat a skillet over medium and add a tablespoon or so of vegetable oil. Add the stuffing and press it with a spatula to form a sort of pancake. Cook for 4-5 minutes until the bottom is golden brown, then flip and cook for another 4-5 minutes on the other side. 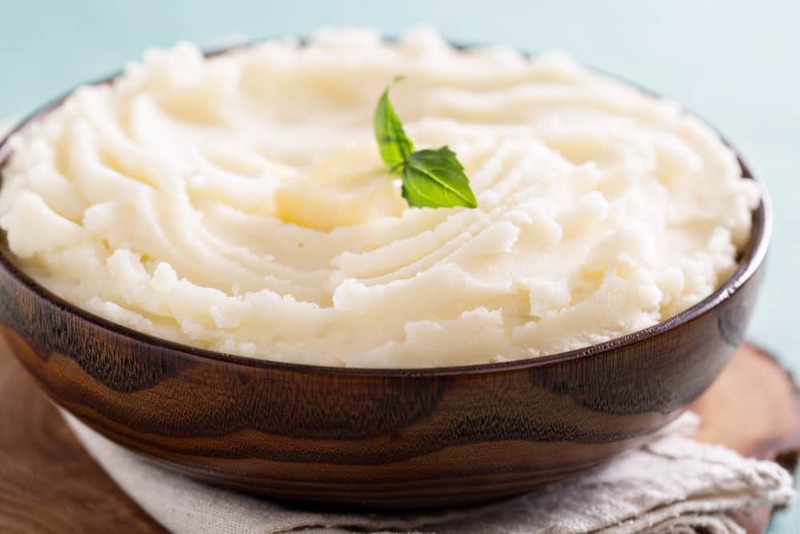 Read this WikiHow article on reheating mashed potatoes and keeping them warm, and this one from LeafTV for more information. If you are specifically making them ahead of time, read this article and watch the video guide from Serious Eats. Put the mashed potatoes in a microwave-safe dish and stir in a few tablespoons of cream or whole milk. Heat at medium power for 2-3 minutes, then check the temperature. Stir and heat at 30 second intervals until hot. Heat a skillet over medium heat. Add a few tablespoons of cream or a tablespoon of oil. Add the mashed potatoes and cook, stirring gently, until they reach 165˚F –about 8-10 minutes. Put the mashed potatoes in an oven-safe dish and stir in a few tablespoons of cream or whole milk. Cover with a lid or foil. Bake for about 30 minutes, until the potatoes reach 165˚F. Put the dish in the oven and heat for 5-10 minutes, until it reaches 165˚F. Stir rice and sauce-based dishes to promote even heating. Some foods, like rice, noodle dishes, and saucey dishes reheat well on the stovetop. Add the Chinese food. If it is something relatively dry, like rice or noodles, add a tablespoon or two of water. Heat, stirring frequently, until the food is hot. Avoid microwaving fried foods, meat, and seafood, if possible, as it will make them tough. Rice and vegetables do better in the microwave. Put the food in a microwave safe container, sprinkle with water, and cover. Heat on medium power for 1-2 minutes. Check temperature, stir, and continue heating until hot. Tamales can be reheated in several different ways. 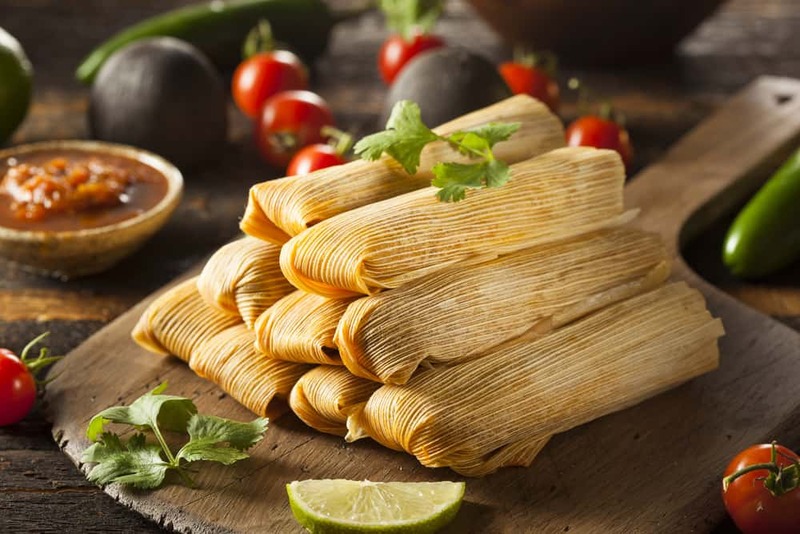 HomemadeTamales.com provides great advice on five different reheating methods, and this article provides a great guide with photos on reheating tamales in the oven, microwave, and stovetop steamer. Fill the steamer with a few inches of water and turn on. Or, fill a stock pot with an inch or two of water and place a steamer rack or basket inside. Arrange the tamales in a single layer and steam for 15-20 minutes. Place tamales, husk on, in a microwave safe container. Cook for 2-4 minutes at full power, depending on how many tamales you have, until they reach 165˚F. Heat the oven to 425˚F. Grease a baking pan and lay unwrapped tamales in a single layer. Cover tightly and bake for 30-45 minutes, until they are golden brown. Heat a large skillet and add 2-3 tablespoons of oil. Unwrap tamales and cook for 2-3 minutes per side, until golden brown and crispy. Wrap the crab legs in damp paper towels and lay them on a plate. Microwave on high for 1-2 minutes, until hot. Heat a large soup pot filled with 1-2 inches of water. Place a steamer basket in the pot and arrange the crab legs in it. Steam for 3-4 minutes, until very hot. Put the crab legs in a baking pan and add 1/8″ water. Bake for 8-10 minutes, until the meat reaches 165˚F. Preheat the oven to 350-400˚F – it doesn’t have to be exact. Put the turkey in a pan and add ½” of turkey stock or water. Bake for 15-30 minutes, until the turkey reaches 165˚F. Place turkey pieces in a microwave safe container. Add broth or gravy to partially cover the turkey, and cover the container with a lid or plastic wrap. Heat on medium-low for 2-3 minutes. Stir or flip the pieces and heat for another 2-3 minutes as needed until the turkey reaches 165˚F. Heat a skillet over medium and add the turkey slices. Cover with broth or gravy, and cook until the turkey pieces reach 165˚F. Brush the corn with melted butter and wrap in aluminum foil. Bake until hot, 25-30 minutes. Place the ears in a covered dish with a splash of water, or wrap them in damp paper towels. Microwave on high for 1-2 minutes until hot. Brush the ears with butter or oil and grill over medium high for 4-5 minutes, until hot. Leftover chicken wings make a great snack – the trick is getting them hot without making them dry or tough. Wings To Go provides directions on reheating wings and keeping them warm, and The Bestest Ever provides directions for both baking and sautéing leftover wings. Lay the chicken wings in a single layer on a foil-lined baking sheet. Bake for 15-20 minutes, until hot. Lay the wings in a single layer on a baking sheet. Broil for 4-5 minutes, then flip and broil for another 2-3 minutes, watching very closely. Heat a large skillet over medium high. Add a little oil, then add the wings. Cook for 5-7 minutes, stirring frequently, until hot. This is not recommended, as it can toughen the wings. It is best if you first shred the meat and use it for a quesadilla or sandwich. Shred the meat from the chicken wings. Place in a microwave safe container, sprinkle with sauce or a few drops of water and cover tightly. Reheat on medium power for 1-2 minutes, then check temperature. Heat for additional 30 second intervals until hot. Place in a microwave safe container and heat for two minutes. Flip and heat for another 1-2 minutes until hot. 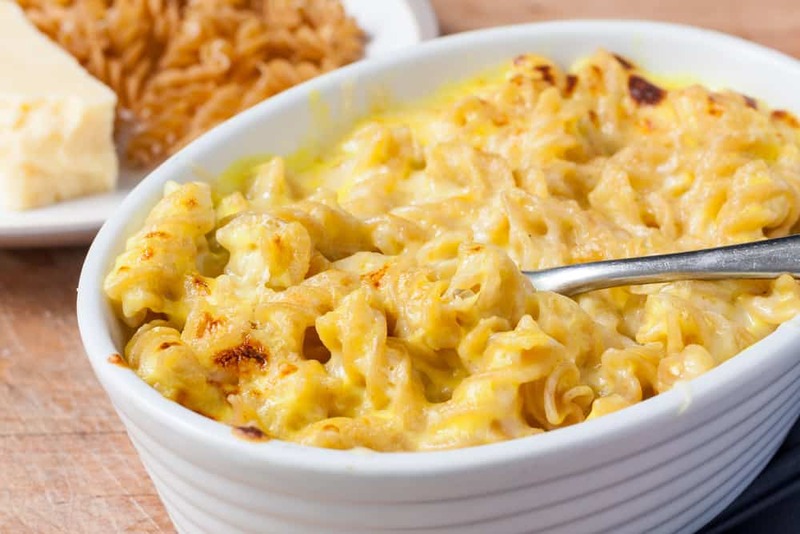 Correct reheating helps preserve the creamy texture of macaroni and cheese. Read this guide from WikiHow, and this article from The Best Ever, which includes instructions for reheating macaroni and cheese in a crock pot. Put the macaroni in a microwave safe bowl. Stir in 1-2 tablespoons milk or cream and cover loosely. Heat on medium power for 1 minute, then check and stir. Continue heating at 30 second intervals until hot. Heat a small pan over very low heat. Add the macaroni and stir in 1-2 tablespoons milk, cream, or butter. Heat, stirring gently, for 5-7 minutes, until hot. Avoid turning up the heat as this can cause the cheese to separate. This method works well for casserole-style macaroni. Place the macaroni in an oven safe dish, if it isn’t in one already. Stir in a few tablespoons milk or cream (skip this step if it has a crunchy topping). Cover with foil and bake for 20-30 minutes. If you want a crunchy topping, remove foil for the last 10 minutes. Place the fish on a rimmed baking sheet and cover tightly with aluminum foil. Bake for 15-20 minutes, until the fish reaches 125-130˚F. Preheat the oven to 325˚F. Sprinkle the fish with a few drops of water and wrap it in aluminum foil. Place the fish in the oven directly on the rack and heat for 10-15 minutes. Heat a pan over medium heat and add a tablespoon of oil. Add the salmon and cook for 3-5 minutes per side, depending on the thickness of the fish, until thoroughly warmed. The microwave is not recommended, as it tends to make fish tough and dry, and create an unpleasantly strong fishy aroma. In a pinch, it works. Place the fish in a microwave safe dish and add a splash of water.If you want, put a pat of butter on top. Cover tightly and heat on low power for 1-2 minutes. Check the temperature, and continue heating at 30 second intervals until warm. Pizza is a common leftover, but it’s hard to get it back to its original state of hot, cheesy, deliciousness. Read this article from Dr. Oz on How To Reheat pizza in the microwave, oven, or stovetop, with a video guide. You might also want to read this detailed guide from WikiHow, with photos, or this video guide from Slate on the pan method. Heat a skillet over medium and add a little vegetable oil. Add the pizza and cover with a loosely-fitting lid. Cook until the cheese on top is melty, 5-7 minutes. If the bottom is browning too fast, turn down the heat. Lay the pizza in a single layer on a foil-lined baking sheet. Bake for about 10 minutes, until the cheese is melty and the crust is crispy. This is not recommended, as it can make the crust tough. However, putting a glass of water in the microwave with the pizza helps it heat evenly and reduces toughness. Place the pizza on a paper towel on a microwave safe plate. Place a cup of water in a microwave safe glass in the microwave next to the pizza. Heat for 30 seconds to 1 minute, until the cheese is melty. Crawfish are a great summer treat. Make sure you don’t waste any leftovers by using these methods to reheat them. Read this article from LiveStrong, and this guide from eHow with instructions for several different methods. Heat a few inches of water in a large pot. Arrange the crawfish in a steamer basket and place in the pot over the water. Steam for about 5 minutes, until heated through. Heat a large skillet and add a few tablespoons of oil. Add minced onion, garlic, or spices to taste and add the crawfish. Cook for 3-4 minutes, then remove the pan from heat and cover. Let sit for 3-5 more minutes until hot throughout. Heat a large pot of water to boiling and add a tablespoon or two of crab boil spices. Add the crayfish and boil for 6-7 minutes, until hot. 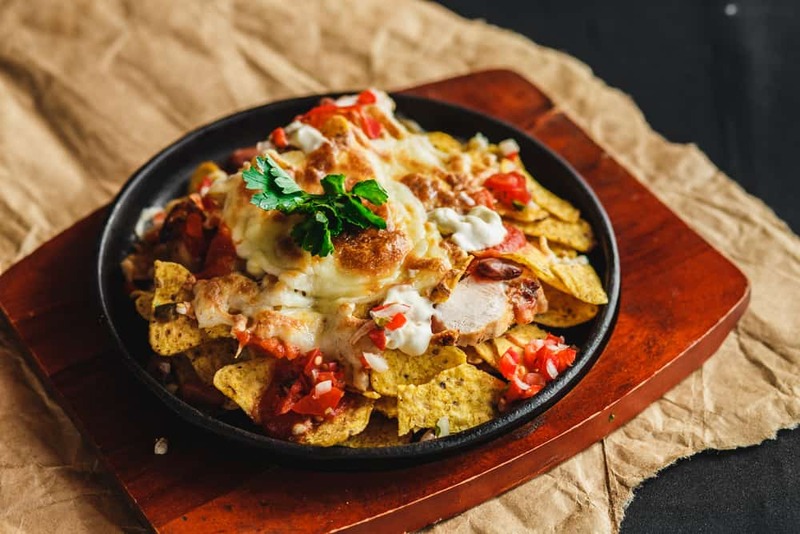 There’s nothing quite as good as fresh nachos – crunchy, salty, savory, and creamy all in one. They can be tricky to reheat, but this oven method will help. Put the nachos on a baking sheet and bake for 5-10 minutes, until they are warm and melty. Watch carefully to avoid burning. Put the nachos on an oven safe pan and broil for 1-3 minutes. Watch carefully so they don’t burn. Not recommended, as it tends to make them tough and soggy. If you have no other option, you can try it. Heat them for 1 minute, and additional 20 second intervals if needed. Fried chicken, pizza, crab legs, salmon – after reading this article, you have the pro tips to warm up and serve all those tricky-to-reheat foods that you avoided before. Now, by carefully choosing between the oven, stovetop, microwave, steamer, and broiler, you can get exactly the taste, tenderness, or crunch you want, so you won’t hesitate to order more when eating out or take home the extras of your aunt’s famous mac and cheese. Leftovers don’t have to be a disappointment – Bon appétit!